Bob May is a longtime resident of Las Vegas and the champion of the 1999 British Masters. 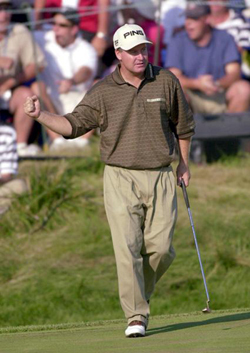 He also finished as the runner-up to Tiger Woods at the 2000 PGA Championship when he lost in a playoff. He continues to play as a professional but also operates the Bob May Golf Academy headquartered at SilverStone Golf Club. He played collegiate golf at Oklahoma State University following a historic junior career in Southern California where he is known as one of the best junior players in the history of the state. Fellow 2013 inductee Ray Norvell made a donation to May when he was a young tour player competing on golf’s mini tours and internationally.